I received this picture as a birthday gift recently. You know you're old when you don't even remember a picture getting taken. It took a bit of hunting to put the pieces together. 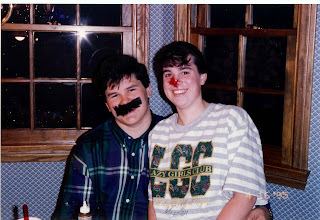 The date stamp says it is April 1995, we met January 1994. The craft glue and feathers tell you that we were doing some sort of project for Margaret once again. It could have been for her REP class or some other group she works with. She is always eliciting the help of her friends in some sort of charity project. Apparently, that day she used the teen helpers in her house. But the part I like most about that picture is that it is a foreshadowing of our future. We are still silly and fun and outrageous. Most people don't get us. That's fine. It only matters that we get each other. Over the years we have done some outrageous things; usually involving chasing and empty wrapping paper tubes. Off the top of my head we have done crazy things like breaking a reclining chair (Sorry, Lainy). Something about tackling the other person and then falling onto the chair causing it to break. Another time I ended up in the pool fully clothed. There have been lots of in between fun too. Caskey is famous for his 'mustaches'. Usually he gets one from the gum ball machine, but he has been known to get one via sharpie (by me). I love how full of life and passionate we are about everything. We have brought that into our marriage and have taught that to our children as well. Examples of this include the time I almost broke my arm when chasing around the house with ice and more recently the water fight at Alexander and William's birthday party. Miss Ellie is full of all sorts of surprises. Although she has been saying da-da for quite a few months she has yet to make any other sounds. She has quite a few intonations and noises so I can tell if she is happy or sad or frustrated, but no ma-ma or ba-ba. She did however learn to cluck or tut, the clicking sound made by her tongue and the roof of her mouth. It cracks me up. If I cluck, she will cluck back at me. She also clucks after I give her kisses (maybe a response to the smooching sound). I was lamenting about this to Caskey how she can't bother to say ma-ma, but she can make this strange clucking sound. He responded, "there is probably an African mother somewhere complaining that her baby can only say ma-ma and not cluck." So true. She has also taken to chewing on her blanket. 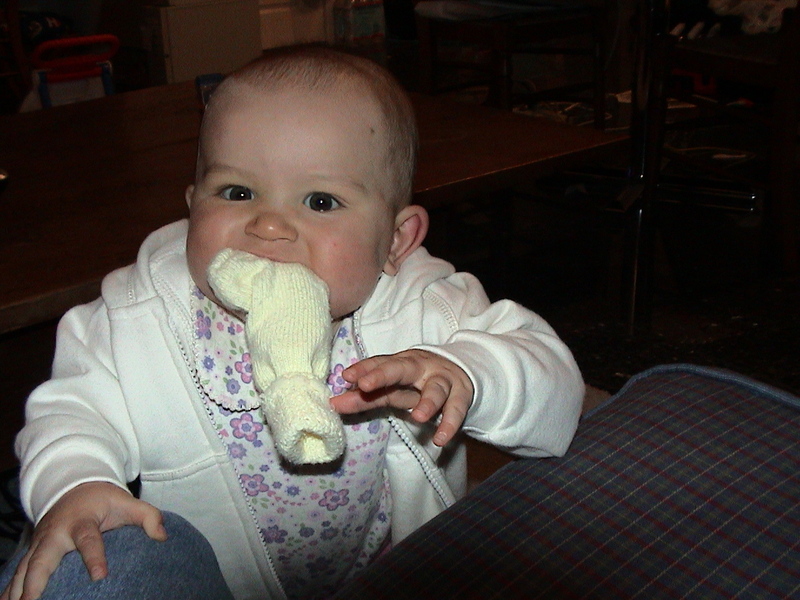 She will stick it in her mouth and hold it there. I'm sure she is just teething, but it reminds me of Lainy Ann chewing on socks when she was about the same age. Lainy Ann would grab a sock out of the clean laundry basket while I was folding and stick it in her mouth. When we first started having birthday parties for our children eight years ago, they were big affairs. We would have around 50 people in attendance. Everything would be coordinated; napkins, plates, etc. We even had centerpieces on tables. I would spend weeks de-cluttering and cleaning before hand. I would make special food from scratch and then hire entertainment for the kids. It was a ton of fun and a ton of work. The guests had a great time, but I found myself running ragged and not being able to visit with anyone. About a year ago I realized that *I* should be enjoying these celebrations of my children getting older too. There was a way to have a birthday party, or any party, where everyone has a great time. The first step was cutting the guest list to only those people we were closest too. Those that we would lean on in a crisis and rejoice with when we have good news. And since those people are our absolute closest friends, they want to pitch in for the party too. Someone brings balloons, someone else brings the dip, we all pitch in. I have found that if you spend a few bucks on new toys from Oriental Trading Company the kids have an afternoon of fun and entertainment. Us parents sit by the street to make sure everyone is safe, then we can just relax. This time it was a joint birthday party for William and Alexander, whose birthdays are 10 days apart. The theme was barely thematic - green, balls, and puppies. The cakes were a green puppy cake for William and an orange and brown A for Alexander. We ordered pizza and had chips and dip and fruit. Grown ups relaxed witha beer and the kids had planes, crafts and balls to keep themselves busy. We pulled the cars out of the driveway so the kids could ride scooters. The 17 children in attendance had a blast and a half. There were few fights and lots of rambunctious fun. But then the grown ups had some fun. 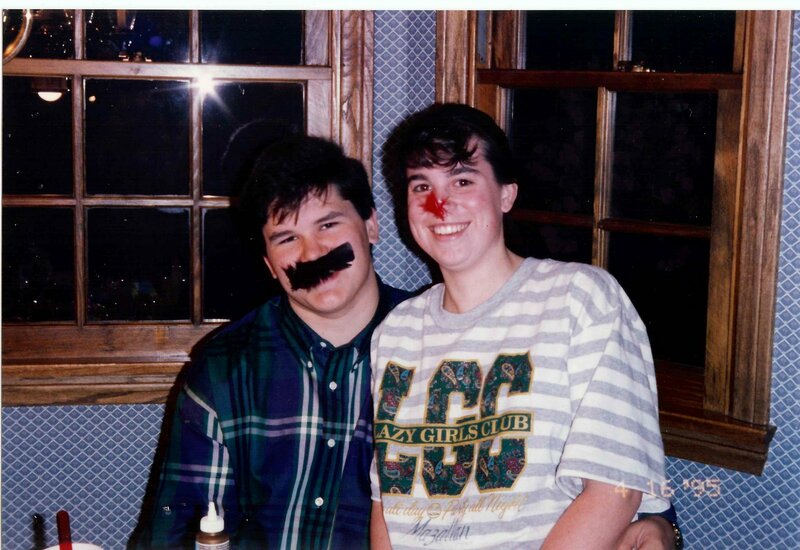 It started when Caskey opened a shook up soda on Melanie, spraying her with diet coke. Then there was some ice, then some more ice down the back of a shirt. But was really started it was when Lainy Ann was brave enough to drop ice down her daddy's shirt. Caskey grabbed the water hose and readied himself for war. At first he sprayed at the children, after all who wants to have to drag home a bunch of soaking wet kids. But then they started taunting him, dashing in and out in front of the hose. Caskey was careful to not spray the littlest kids, but the bigger kids were drenched. Then he started spraying the grown ups, just a tad, but enough to elicit squeals from the moms. We all started keeping our distance from Caskey at that point - no one wanted to get too wet. Then I heard hushed whispers trying to get my attention, you know the yelling kind of whisper, "LESLIE". I looked across the yard to a movie moment. Melanie was taking big tip-toe steps towards Caskey, who was facing away from her. In her hands was a jug of ice cold water. The whole thing happened in slow motion for me, just like in the movies. Step, Step, Step, SPLASH! CHEERS! APPLAUSE! Then more squeals. Everyone was so excited to see Caskey 'get his' that we let out a roar and applause. Then he sprayed all of us for cheering. Mindy was the next to sacrifice herself - she ran into the stream of water and cinched the hose while John searched out the spigot. The game was over. Everyone was a little wet, some people were drenched. And Lainy Ann, who essentially started the whole thing, remained dry. It was great fun having our closest friends celebrate our lives with us. They stayed, ate, drank and played. They loved on our kids and we all shared stories of our lives. Some of these people I have known my whole life and the person I have known the least amount of time I have still known for over 5 years. I know it wasn't my birthday party, but I felt like it was. These women, these families, . . . . we love each other. They are my village. I feel so grateful that we were all able to celebrate life together today. It seems Eleanor is indeed a Dickson. Up until now I wasn't so sure. I am obviously her mother, but there have been so many things about her that are so vastly different from my other 4 children. Her blue eyes, thumb sucking, happy go lucky attitude, sleeping through the night and generally a happy baby with no fear of strangers. She is just so easy going, so unlike my other kids. I even dragged her around Legoland for 4 days. The poor girl was strapped in her stroller or in the Ergo for 10 hours every day. She would smile and ask for food. But no complaining or whining at all. Until Saturday. After days of entertainment at Legoland and playing with her siblings she found herself without them on Saturday. They had gone to Knotts Berry Farm without her. I got out a new toy and left her to playing so I could quilt. Nope. She wasn't having it. She was cranky. She didn't want to sleep, stand, sit, lay down, or play. She complained all day long . . . until I took her on a playdate with her Godmother. On Sunday she was a much happier baby as we went shopping in the mall. She had all her siblings to entertain her as we did all of our errands. Once we got home she sat with her two oldest siblings; Lainy Ann and Connor, playing Legos. She had all the Duplos to herself. She got to sit and play in her big sister's room, a room that is usually off limits, and play like the big kids. Usually they play at the kitchen table, to keep the small pieces out of reach. But today she was in on the action. She squealed and hollered and laughed for almost 90 minutes. She went from seated to her belly and back onto her bottom again. A first for her. Apparently she is like all the other Dickson kids. She needs to be in on the action and play with big kid toys. None of this baby-stuff for Miss Ellie. When I was a child my mother decorated her kitchen in geese and blue and geese with blue ribbons. I didn't think much of it. But then as I visited my friend's houses I realized that their mother's kitchen were decorated in the same theme. And even today I will catch glimpses of blue and geese leftover in kitchens from the 1980's. As an adult I have wondered what the appeal was. I have seen other themes over the years. My mother-in-law has cows in her kitchen. As I started my own kitchen collection it never occured to me to have an animal-theme in my kitchen. I must have a chicken-kitchen. My best buddy got me a chicken for my birthday. A whimsical chicken. I don't even particularly like chickens. Its what the chicken represents. It does not represent towels . . . or maybe I need chicken-kitchen towels . . . I do. I think I need chicken-kitchen towels. Whimsical chicken-kitchen towels. To match my whimsical chicken. My 35th year is starting off with a bang with my chicken. Its so nice to be loved by someone so much that you get a chicken. At least its not a tire.